To aid in my learning to play the piano, I have considered getting a metronome. Metronomes seem to be subject of some discussion in the world of music teachers, so I’ve collected some of the thoughts here. A metronome attempts to teach the student a consistent rhythm and to aid in determining the correct speed at which to play a piece of music. 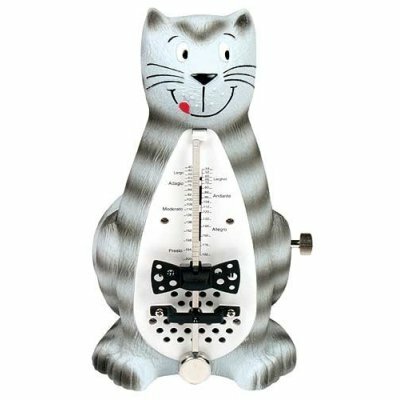 Some schools of teaching insist that the metronome only be used for teaching how fast a given speed “feels”, and that it should never be used while playing or doing rhythm exercises. This puts the main burden on the shoulders of the student, and should give the student a better internal rhythm. It doesn’t, however, prevent the student from losing rhythm in the difficult parts of a piece, and the student has no external way of keeping track of how well he is holding his pace. Using the metronome while playing pieces, on the other hand, is recommended by some teachers. It is said to be easier to start at a lower pace, and slowly speed up the metronome until the desired playing speed is achieved. It removes the task of keeping the correct rhythm from the student, giving him time to focus on the notes in the music. However, it may also render the student unable to play consistent speeds without a metronome ticking. I lean toward the second method, of course with the provision that the metronome should only be used for a period of time, after which pieces should be well enough learned for the student (me) to hold the rhythm without external reference. I found a great article concerning metronomes that I will paraphrase a bit from in the following. These are little electronic devices that go “beep” whenever there’s a tick. I made stuff like this in the 5th grade or so, though modern ones have all sorts of different stuff like built-in tuning. I’m sure it’s great for guitarists and such – I don’t need it. If my digital piano goes out of tune, I’m sure I won’t be able to fix it that easily. So I found it. The metronome I want. It’s mechanic, and it’s funny – it’s shaped like a cat. This entry was posted in Life and tagged Piano on August 1, 2007 by mihtjel. That is the most awesome metronome ever! I’d agree with the last bit of the ‘when to use a metronome’ – use it to help you get the rhythm to begin with, use it to gauge when you’re playing it at the right speed, but don’t use it much apart from that. In case it is of interest, I found the best way to learn a piece was hands separately, and learn it in short overlapping segments. Make the segments as short as you need – I remember spending ages just practicing the leap between 2 or 3 sets of adjacent chords, so that the finger movements worked into long-term memory. Once your fingers know what they’re doing, you can put it all together and gradually work it faster until it’s all right and up to speed. Bit boring, but works in the end!